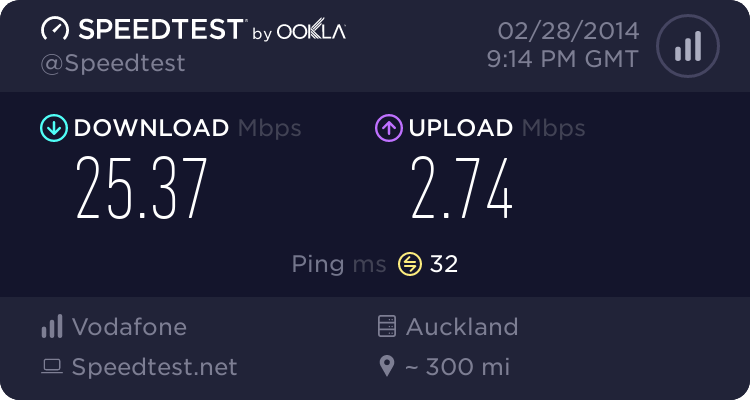 I can say that driving down the motorway in Auckland it can take 4 or 5 attempts to connect a call on my iPhone. It's been VERY close to going out the window on many occasions. Either a) my iPhone is faulty b) the whole model has issues c) Vodafone is useless. I assume it's a bit of all three, but Vodafone sold me the phone and Vodafone run the network so it lies with them to make the two work. Sort it out! It's actually appalling. But I don't have the time to lodge faults every time I have an issue because I have bigger problems to deal with. Like a new one...one of my customers got an iPhone, the store offered to put it on his wife's account then switch the numbers because he was going to be hit with huge ETCs. This was a few weeks ago, the day he went overseas...now he's back he's called me to say that his calls are going out as her number. She has no service at all. And the iPhone data is activated, but his SIM now has his wife's number. And guess what....no Vodafone CSR wants to/can help. Will have to try the store tomorrow morning but this is just disgusting. It's lucky she doesn't rely on her phone, being pregnant and not having a land line. Nice one Vodafone, you've outdone yourselves once again! Oh yeah. And he has crappy reception too. Id post this on the Vodafone Forums as well. Strange??? My 3G phone works fine, no dropped calls and very rarely out of 3G coverage? Oh wait, its not an Iphone. kiwitrc: Strange??? My 3G phone works fine, no dropped calls and very rarely out of 3G coverage? Oh wait, its not an Iphone. Ok. So where do you live? Maybe 3G sat phones are what we need? Everyone's experienced problems with their 3G phones. Battery life takes a huge hit and all the manufacturers are still trying to tweak software to accomodate. The problem is exacerbated here with the 3G-GSM-3G switching that most people experience in their day thanks to our geography. It becomes easier for most people to simply switch off 3G altogether as confusing the phone with mutliple switches between GSM and 3G leads to all sorts of problems like call dropping. The handoff which was supposed to happen seemlessly was a huge issue at the beginning and it isn't entirely fixed. VF just released the latest channel news informing staff to stop advising customers to turn off 3G. In the Tauranga area where I live a lot of the new sites are 3G only. And using GSM only, finds you with poor or no signal at at all. Turning off 3G is a very poor option because GSM is overloaded, I am assuming this is why I cannot make calls and I have been getting messagePage txts all morning yet my phone is rarely ringing. If 3G worked, and the iPhone had stronger 3G reception, then there wouldn't be an issue because GSM wouldn't be used. This is why the network falls over when 3G dies because it would seem Vodafone cannot run it's network on GSM alone these days. You're right. When VF upgraded to 3G a few years ago the logical decision was made to try and spread capacity over both GSM and 3G. This means that during the last 3 years as the network expanded, a certain portion HAD to migrate to 3G sites or they would run out of capacity. Now if everyone suddenly turns off 3G on their mobile the network would quickly overload and many users wouldn't get reception. This doesn't change the fact that if there was sufficient GSM capacity, handsets would last longer on a single charge and users would experience less call drops and receptions issues. That said, WCDMA is an undeniably better technology and will continue to experience improvements. Once 900mhz is live with this protocol, compatible handsets will almost never switch back to GSM and users should notice a marked improvement in reception and quality. Battery life will, however, continue to be the bane. I've had 3G so long that I'm used to the battery life...I have a charger at home, in the car and at work. So I'm nearly always on the charge/near a charger. I can't last the business day without going on charge. It's just a fact of life. And that is why I love my nokia 1100s with the fatter batterys in them to replace the one that died - 2 and a bit weeks of standby, ample talk time and charge in no time at all. What annoyed me with a phone I had from a relative while they were overseas was there was no 3g only option on the network selection, just gsm only or dual mode, and here at home it was constantly bouncing between the 2 with the corresponding constant polling to the celltowers and only getting barely a day. In gsm only it was bouncing between sites all the time (this was pre-vodafone getting their crap together) and was still unreliable. N95 in 3g only constantly works. The iphone also seems to have crap speakerphone performance as well, which may be why people are blaming signal for no sound, when its really just the speakerphone mode in it. richms: . . . What annoyed me with a phone I had from a relative while they were overseas was there was no 3g only option on the network selection, just gsm only or dual mode . . . If only the iPhone was UMTS900! Speakerphone performance is sub-par but it's not really intended to be a proper PDA but more an mp3 player with a web browser and a phone built in.